With special thanks to Klaus Weidner. This is a comparative review of two books by the same author. The Andromeda Strain was originally published by Alfred A. Knopf in 1969. Sphere was published by the same publisher eighteen years later. If you read only the back covers, there’s hardly any similarity between these two books. One is about an alien spaceship discovered at the bottom of the sea; the other is about a frantic research race to stop a new virus from destroying humanity. And yet, despite the different outer shells, the two books share a great deal. Both books describe a contingency in which a select crew of scientists, assigned in advance by the US Army as a team for handling a certain kind of crisis, are called into action. These scientists are the leading experts in their fields, but they never believed the problem for which the team was set up will ever take place. They are more than amazed when it actually happens. Once on-site, the scientists eventually find themselves closed in some military facility, trying to solve a puzzle. Over time, as the reader suspects all along, the problem turns from a scientific curiosity to a threat to their lives, and perhaps to the future of mankind. Unsurprisingly, though, the happy-end safely awaits us all. But the general plot outline is where the similarities end. The differences are in the “plot parameters”: who the scientists are, what the problem is, the time and the location. In The Andromeda Strain, the problem is an unknown disease, probably bacteriological, brought down by a military research satellite. The disease is airborne and it kills swiftly, within a few seconds. At first, the scientists believe that the plague is confined to their well-sealed underground research lab, because the contaminated area was bombarded by a nuclear device. Later on, they find out that for political reasons, the area was not in fact bombarded, and the airborne disease is riding the winds on its way to Los Angeles. And then the safety seals in their lab start giving away, and they themselves are exposed to the problem. In Sphere, by contrast, the event that brought the team together was the discovery of a space vessel at the bottom of the ocean. It is clearly not an earthly vessel, since it has been lying down there for at least three hundred years, long before humans had even airplanes. Rather than an underground research lab, the scientists are confined to a U.S. Navy deep-water habitat. When they discover the power of the alien force facing them, they realize that not only they are, but the entire world is, at risk. The differences are so superficial, and the similarities so great, that I think Crichton simply presented Sphere as “An Andromeda Strain for the 80s”. When the national interest is no longer fear of the atomic bomb or biological warfare, but rather aliens and UFOs, Crichton took an old mold and filled it with some new content. But what I found most curious is not the differences in plot, but rather those of style. Not often does one get to see the same author writing (almost) the same novel, twenty years later. 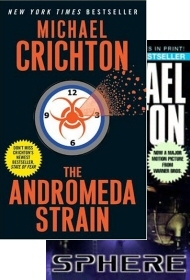 When Crichton published The Andromeda Strain, he was a young scientist (a medical doctor) writing a book about a scientific problem. By the time he wrote Sphere, he has become a seasoned best-selling author with a scientific background. The change is felt in every single chapter of each book. The Andromeda Strain reads more like a scientific review than a novel. It contains many diagrams, screenshots, and technical computer printouts that (at least try to) convince the reader of the scientific seriousness of the issue. A detailed explanation accompanies almost every printout, and paragraphs quoted from actual research papers explain each idea presented. In the late 60s, computers were still novel devices, so Crichton even bothers to include an explanation about converting decimal numbers to binary. But perhaps the most obvious indication about the author’s frame of mind comes from the fact that a detailed list of references is appended to the book -- an uncommon sight in novels. The style of Sphere, on the other hand, widely differs. The ideas presented are no longer based on concrete scientific grounds -- some of them are as far-fetched as time travel, some even more than that. When scientific data is presented, it is done in a fleeting way. In fact, the leading character falls asleep during one of the explanations, a simple narrative device for sparing a boring lecture from the readers while hinting that this is, after all, real science. No maps, computer scan printouts, or diagrams are included. Obviously, no references are included in this book, either. In science-fiction terminology, Crichton of '69 was a very hard-core author. In the late 80’s, he is a rather soft-core one. One beautiful thing that Sphere does include is the message encoding scheme used by the alien. The actual code is included in the book, along with an explanation on how it was cracked -- simple enough for every reader to try his hand in the act of deciphering. A computer is needed, but you don't even have to turn it on: it is the form, not the content, that matters. However, most readers (including myself, I must admit) will never go ahead and try to do it: they will rely on the decoded message as presented by one of the characters. The rest of the team does that as well, and when they come to realize their mistake, it is almost too late. So we can see that Crichton is less of a scientist in his later writing. But is he more of an author? Sphere is clearly a book written by a more mature author. The characters, for example, are much more complete, even though their personalities are taken to such extremes that they are almost caricatures -- Beth, a caricature of a feminist; Harry, a caricature of a depressed child; and so on. But the characters are definitely better presented. Other indicators, however, show that Crichton is more of a populistic author today. In The Andromeda Strain, the tension was always subtle, yet clear and sharp. Only once was the tension artificial, and even then it was gently done -- when Dr. Hall races against the clock to stop the atomic self-destruction device from detonating. In Sphere artificial tension is present in abundance, like the various “I am coming” messages from the alien, and the slow advancement of the giant monsters. Personally, I enjoy gentle, ongoing background tension over bold, massive attacks on the reader’s calmness. In general, I think that The Andromeda Strain is simply a superior book. There is probably more than one reason to this, and it doesn't have to do only with the writing. One redeeming feature of Sphere is the surprising twist at the last few paragraphs. It is so subtly hinted, though, that I have actually missed it on first read. I just read Crichton's novel ''sphere'' and it is one of my favorite novels now! thought Hmm...Michael Chrichton is trying to get across the idea that Beth has grown from the experience and has unconsciously dropped some of her general resentments and is therefore more lovely on the outside as well.